VOGONS • View topic - Need help repairing a Gravis Ultrasound Classic 2.4! Need help repairing a Gravis Ultrasound Classic 2.4! Re: Need help repairing a Gravis Ultrasound Classic 2.4! Good news! I got it to play music! I copied all of the .pat files and other contents of the midi folder from the gus complete pack (ult\midi) to the ultrasnd\midi folder and now it works! Thanks for the tip Rawit. I'm still only getting sound from the left channel though. I'm also having trouble getting it to consistently make any sound at all. Touching the audio jack cable (line out or spk out) while the system is running makes the audio cut in and out a bit and eventually it will stop completely. Once it stops completely, shutting the system down and turning it back on will bring the audio back, but it isn't real consistent. I'm hoping it just needs a recap. It seems like something is very sensitive to changes in the physical connections. I also had a slight pop from the speakers (both, even the right channel that gets no output) when I connected a midi cable to the gameport. It had nothing connected on the other end so it must have been static related. It was in pretty sorry shape when I got it so it could be any number of things, but I'm really happy to hear it play music. I must say, the "midi256" demo tracks that come with the gus complete pack sound fantastic, even with just one channel and a flaky output. I found a way to get some (tested!) memory for this thing super cheap, so I ordered some. I'll keep tinkering with it. I have to keep reminding myself I'm also using a 20Mhz crystal rather than the 19.7568 one that is expected, so there is a slight possibility that that is causing the issues, but at this point I'm thinking it is a bad cap\chip, broken solder joint or something else electrically wrong, rather than a timing or clock issue. I have no knowledge of these things though, so if someone else any more input, it is welcome. All in all, this is proving to be a fun restoration. I do wish I had a way to refinish the red PCB coating in areas where it has flaked a bit from improper storage, but I don't want to mess it up further. Another thing I'm noticing is that I can faintly hear music coming from the motherboard when music is playing. Sort of like the sound of coil-whine from a high powered graphics card when running at high frame rates. I used a high tech precision listening device (a bic pen tube with a tiny funnel on the end) and narrowed it down to the tiny crystal oscillator on my Wintac W6BXA 440BX motherboard. Why this would be resonating to the frequency of the music, I have no idea. Maybe its a side effect of the crystal on the board not being exactly correct, or it could be related to the odd electrical issue I've been having with the card. Anyone ever hear their computer play high pitched mini-midi music from a crystal before? I used the highly technical knowledge of electronics I have amassed over the years to conduct the following test: tap all over the components on the card while it is playing music to see what affects the audio cutting out. It turned out to be a couple of loose JUMPERS on JP6 and JP9! One of them was causing the left channel to cut in and out, the other was presumably causing the right channel to not work at all. It looked like they got squashed at some point. The jumpers were a bit wonky looking and the pins they were supposed to be connecting were slightly bent so they wobbled easily. By straightening the pins and putting a good tight jumper on them (check the pics in the OP for locations... they aren't numbered) the problems completely went away. The output is beautiful now! I do still get that noise from the crystal on the motherboard though. If I can get my hands on the proper crystal for the GUS, I guess we'll see if that is causing it. The music and digital effects appear to be working fine in the games I've tried (with native GUS support), so this GUS Classic appears to be 100% working now, even with the 20Mhz crystal. If there are any recordings of the midi256 demo music online I'll be able to compare them to see if things are a little bit off. I'm guessing the pitch will be off a little. Overall, I'm really happy I got it working. After selling the scrap and keeping a few other surprisingly useful things from the lot this card came in, I paid a fraction of what one of these would have normally cost. I can't wait to hear how it sounds in various games and demos. Maybe some day I'll be brave enough to hook it up to my midi keyboard and see what I can do with it. Okay, I've been trying to compare the music on my GUS to recordings I've found online but I keep finding DOSBox emulated recordings, which aren't going to be exact either. I made some brief recordings of the midi256.exe demo included in the gus complete pack and attached them to this post. If anyone with a discerning ear could listen to these and tell me if they notice any obvious flaws, please let me know. I'm just trying to figure out if the 20Mhz crystal makes any discernible difference in music playback compared to the original 19.7568Mhz crystal. Keep in mind, my card only has 256K right now. I'm not sure if midi256 demo will sound different with more memory on the card, so it'd be best compared to a card with 256K on it... but if anyone who owns ANY GUS could compare these recordings to the output of their card, I'd love to get some feedback from someone more experienced with these cards. There is definitely something in those recordings that doesn't sound quite right. There is some distortion in the playback of JESUJOY.MID, but it isn't clear if that comes from the card itself, or if it's just your recording. Listen carefully to the strings; it that from the card itself? LATINDNC.MID also sounds somewhat odd, but I can't quite pick out what it is. I'd have to make a recording of my GUS PnP and compare carefully. It's almost as if the playback speed and/or pitch is off. It should also be interesting if you try playing a 4-channel MOD file (to ensure 44.1 kHz playback) as well as a 16+ channel S3M or XM. 640K!enough wrote: There is definitely something in those recordings that doesn't sound quite right. There is some distortion in the playback of JESUJOY.MID, but it isn't clear if that comes from the card itself, or if it's just your recording. Listen carefully to the strings; it that from the card itself? Sorry, it was the recording. I couldn't hear it on my setup because by the time I did the recording it was very late and I had my speaker volume down. Listening on headphones I see that its really obvious there is distortion. It didn't sound like that on the GUS, so it was probably because I hadn't lowered the volume on the GUS so it was probably outputting too strong for my PC's mic-in (line-in combo jack is occupied by my SPDIF out currently). I'll try tinkering with it again soon to get a clearer recording. I'm not familiar with MOD, S3M or XM files though. Where would I find these and what do I use to play them? Ozzuneoj wrote: I'm not familiar with MOD, S3M or XM files though. Where would I find these and what do I use to play them? MOD files originate from the Amiga (SoundTracker/NoiseTracker/ProTracker and clones), and there's truckloads of them from various sites. There were also a few MOD files and other types installed as part of the UltraSound software package. There were also a few players on the disc. 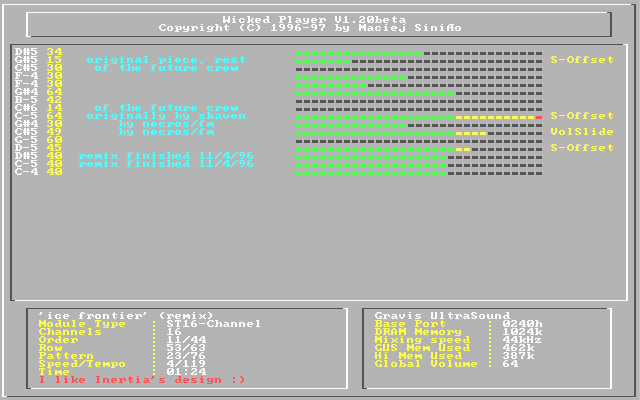 There used to be some variant of UltraTracker, as well as WILLOW.ULT. That should make a good test. Use some of the players, find a MOD file with voice samples, and try one of those. To verify any distortion or pitch/speed changes, play the same file on another system under Windows using XMPlay to compare. To add to my previous comments, there is a file called MODDEMO.BAT that is part of the basic installation. It will use IPLAY.EXE (also part of the standard installation) to play a selection of included MOD files. I have attached recordings from my card (version 1.0 GUS PnP) so that you can compare, if you like. The MIDI files were played using the original 16-bit UltraSound patch set and the old PLAYMIDI, rather than any newer, InterWave-specific software; this ensures that the InterWave will be in GUS-compatibility mode during playback, and will sound as much like a GF1-based GUS as it can. The other files were played back using the InterWave-only PLAY.EXE, but playback should still be somewhat similar. Thank you so much for the comparison 640K!!! That is very obvious with them playing back to back. I'll try to keep my eyes open for one of those oddball 19.7568 crystals. I would really really appreciate it if anyone here had a chance to take a look through their collection to see if any cards from the early to late 90s have a 19.7568Mhz through-hole crystal, specifically one made by Ecliptek. I'm not going to ask anyone to harvest a part for me, but it will give me something to look for when I'm sorting through scrap lots and other such things. Otherwise, if anyone wants to split an order of them from somewhere I think I can get a bunch with a minimum order of $20. There's a slight chance I might use more than one eventually, but I certainly don't need $20 worth of them. On another note, I found a memory board that had 32 DIP20 chips that should be compatible with the GUS classic and they were all socketed. Strangely, they don't all work! There are four banks on the board, two of one type and two of a slightly different variant. The chips from two of the banks pass the GUSDRAM test, the others do not! All of them show "good" during the quick initial test, but the ones that don't work show "bad" part way through the more detailed memory test and at the end it reports an odd amount of usable RAM. 10 out of 10 of the one type didn't work, 10 out of 10 of the others did, so it doesn't appear to be a real defect. Upon looking at the data sheets, the only difference I see is the "supply current max" are higher on the ones that don't work compared to the ones that do (including the original TI chips). After running for a while in the GUS, the ones that don't work are ever so slightly warmer to the touch compared to either of the others, but it's barely noticeable. Here are the datasheets, if anyone is able to spot any other reasons why these other chips wouldn't work in the GUS. The original chips are 80ns, the others are all 70ns. Apparently this GUS Classic is somewhat picky about DRAM? The absolute cheapest way for me to get ONE of these is to order 21 of them (minimum $10 per-sku order) and then pay $9.50 shipping. I briefly asked them if it was possible to do a smaller order or use USPS first class as a one time courtesy and they said no. Too bad... a site like that with such a large selection of rare old components could probably be very popular with retro computing enthusiasts who do repairs, but when you're forced to spend $20 minimum for a single component or a whole pile of stuff, its hard to justify. Picking one each of 10 different items would cost a minimum of $110, so saving up for a big order wouldn't work either. Too bad... no one else seems to have these things. I'm pretty sure IPLAY (InertiaPlayer) do not take advantage of your gus memory and onboard processor for the hardware mixing. OpenCubic support both iirc, but you have to make sure to use devwGUS in cp.ini, watch during loading. I would recommend trying DMP (Dual Module Player), CMOD (CapacaMod, my favorite) and GLX (Galaxy Music Player), of course you have to respect memory limitation. InertiaPlayer uses GUS RAM, not sure about hardware mixing though. Rawit wrote: InertiaPlayer uses GUS RAM, not sure about hardware mixing though. Unless I'm mistaken, you can't play anything on a standard GF1-based device without using the on-board RAM. Even for basic digital audio playback, ULTRAMID uses a block of on-board RAM, transfers the data via DMA (or can fall back to PIO), then plays from that buffer. Inertia Player appears to use both GUS RAM and hardware mixing. If you look at the display in text mode, you will see the displayed sample rate change, based on the number of active channels. That definitely wouldn't apply if they were mixing to two channels in software. The included version does try to play ULT files, but does a somewhat poor job of it. Last edited by 640K!enough on 2018-11-14 @ 03:47, edited 1 time in total. Thanks 640K!enough and Rawit, you where absolutely right, iplay fully use the gus hardware. I had difficulty to make a 16+ channels music that I could track and play it with iplay, but for some reasons I had ultra tracker and your suggestion, 640k!enough, made me remember I could use it. So I made many .ult with more and more channels and I was able to have iplay use each frequency ramp listed in the GUS SDK 2.01 listing from 44khz down to 19khz. Proof enough for me, I stand happily corrected and I'm eager to my next music listening session with "guess the player"
@Ozzuneoj because I felt I hijacked a bit your thread, I searched for oscillator on my old hardware but all I found is 18.436 and 20.000 so I guess I cannot help? It was a soft modem and and isa nic. I'll keep an eye open for you tho.